Please send your feedback, ideas, requests for membership and other thoughts to info(at)teachaccess.org. The Silicon Valley Community Foundation became the “fiscal sponsor” of Teach Access, to act as the project’s 501(c)(3) and to improve logistics and donation processes. We applied for funding from two foundations to establish Faculty Curriculum Development Grants to encourage development of curriculum modules that address design and development of accessible technology, to be included in existing courses. One foundation grant has already been awarded and a Call for Proposals will be issued by April 16, 2018 on our website. 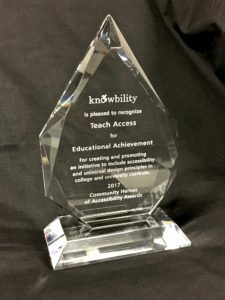 Teach Access won the “FCC Chairman’s Advancements in Accessibility” Honorable Mention Award, as well as Knowbility’s “Heroes of Accessibility” Award. The Industry Guest Speakers program was launched with participation by industry members, both online and in-person, for member universities. 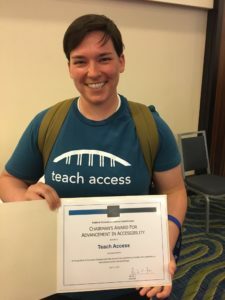 We published an updated Membership Framework, that explains what it means to be a member of Teach Access and how to join. In October of 2017, the Teach Access Task Force leaders convened a strategic planning meeting at Stanford University to set 2018 goals – more on this below. We established a relationship with the Partnership on Employment and Accessible Technology (PEAT – a project funded by a grant from the US Department of Labor) to advance our common outreach and program goals. We applied for a Teach Access trademark (thanks to the legal beagles at Facebook). The University of Michigan offered a Fall 2017 class, “Accessible Software Systems Design” taught by Prof. David Chesney and Olin College is offering a Spring 2018 class on “Technology, Accessibility and Design.” Many more such courses are becoming available – if you know of one, let us know. Industry members delivered Faculty Boot Camps at Michigan State and the University of Michigan and at the Accessing Higher Ground conference (presentation available online). Planning for the pilot 2018 “Study Away Silicon Valley” initiative is well under way, bringing 30 students from four universities to Silicon Valley for a week in May 2018 to spend time at tech companies and with industry representatives to learn about accessibility fundamentals and develop their own projects. The Teach Access Student Ambassador program was kicked off at Stanford. We participated in hackathons and student competitions at CSUN and MIT. We continued work on an “evidence packet” of informational materials for faculty and learning support staff to provide to university and departmental leaders to gain buy-in. The Teach Access website has been refreshed and enhanced with informational pages about Study Away, Faculty Grants, and an updated Resources page. Monthly meetings of the Leadership Team are being convened and quarterly meetings of the newly constituted Task Forces will begin. With the Study Away Silicon Valley project about to welcome 30 students to a great week at the end of May and the Faculty Curriculum Development Grants soon to be launched, we’ve started the year with two substantive and tangible initiatives that will help Teach Access make real progress on our mission. Scale up: Expand the number of post-secondary institutions incorporating the principles and fundamental knowledge and skills of accessible design and development into courses in computer science, design, user experience research, human-computer interaction and related fields of computer science and design. Industry Lectures: Determine the usefulness and efficacy of the Industry Guest Lecture program (mostly available as live online lectures); develop marketing plan. Faculty Bootcamps: Organize and conduct Faculty Bootcamps with an emphasis on expanding to Midwest, mid-Atlantic, New England and multi-university collaborations. Materials: Curate and evaluate existing teaching materials and publish new ones, to build a free, openly available, well-vetted curriculum repository of teaching modules. Accreditation: Expand and update design and engineering school accreditation guidelines, with a focus on ABET, NASAD, ACM. Presentations: Select and propose presentations for influential mainstream higher education and technology conferences. Evidence packets: Prepare and design evidence packets for university leadership to clearly and concisely articulate, with convincing data, industry and societal needs for skilled workforces of the future on the subject matter of concern to Teach Access.